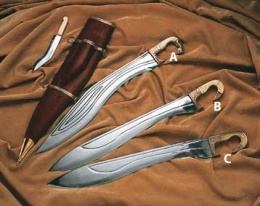 A) This sickle-shaped sword/dagger is similar to the Kukri, in shape as the accompaning small knife, a brass hilt, distictive fuller design, and co-ordinating leather covered wood scabbard highlight this ancient style slashing sword. A) Decorated hilt of a 4th or 3rd century BC falcata from Almedinilla, Córdoba (M.A.N., Madrid). This page was last modified on 10 July 2013, at 20:34.